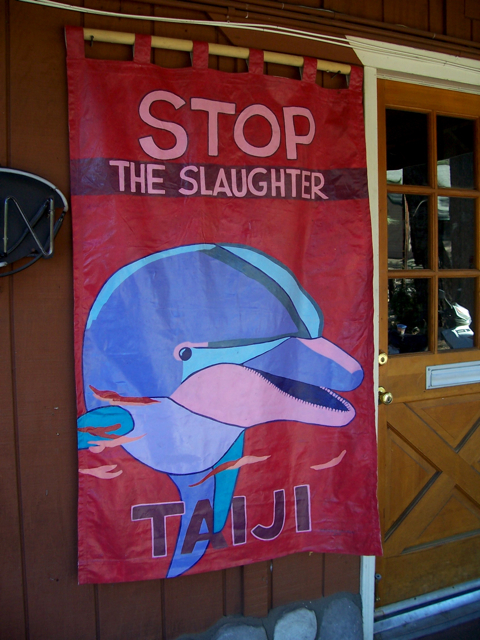 Taiji, Japan is 8,342 miles from Idyllwild, California. 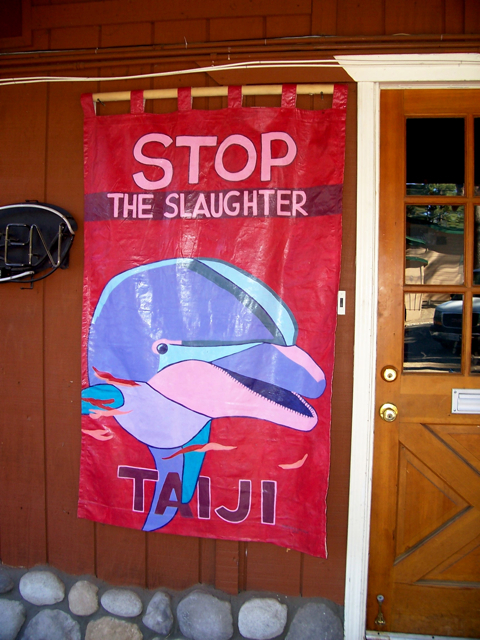 Yet, the distance is not stopping one Idyllwild resident from doing his part to pressure the Taiji government to stop their 20,000 annual dolphin slaughter. It all began in March when Jeffrey Taylor, from Green Cafe, showed “The Cove,” this year’s Academy Award winning documentary, to about 25 residents, which included professors, scientists and animal activists. It was part of his weekly “Cafe Cinema” series that he’s held in Idyllwild for 10 years. Many of his friends couldn’t bear to see dolphins killed onscreen, yet, those who went said it wasn’t such a graphic portrayal, and getting out the message was key. Ric O’Barry, who rose to popularity with “Flipper,” the popular TV show about dolphins in the 1960s, said that he became an activist when he saw that dolphins would rather die than be in captivity. “Dolphins are keenly sensitive to noise,” O’Barry said in the movie. “They are afraid of the noise and swim to the cove to get away from it. There, they are herded into nets and the bottle nosed dolphins are sent to marine parks like “Sea World,” while the other dolphins are slaughtered with spears. Since the showing, Taylor has not been quiet about the Taiji dolphin slaughter. He regularly visits web sites dedicated to dolphin preservation, and e-mails updates to his friends and customers. Among the information that he’s sent include news reports about the toxic levels of mercury in Taiji; O’Barry’s recent trip to Toyko; a You Tube video account of a young woman who swam in the Taiji Cove; and a slide show by Leilani Munter, a dedicated volunteer. All of the portrayals show worldwide support of the ban on the dolphin killings. When O’Barry visited Toyko (because nationalists threatened him in Taiji) with 100 other supporters, he had a list of 155,000 signatures from supporters all over the world. Some of the supporters are from Idyllwild, and, like Taylor, are unwilling to give up the fight. 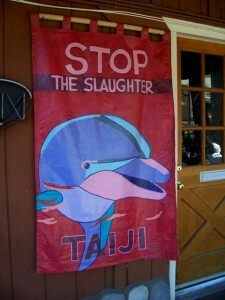 However, many Japanese do not know about what is going on in Taiji, and would likely not approve of it. In the documentary, tests prove that dolphin meat has toxic mercury levels, and is not good for human consumption. In fact, in the May 10th issue of the Japan Times (another article sent by Jeffrey Taylor), the National Institute of Minamata Disease (NIMD) stated that many Taiji residents have unusually high levels of mercury in their systems. Even with mercury poisoning, Taiji’s 3,000 residents remain defiant. They say that killing dolphins is no different than killing cows or pigs, and people should mind their own business. But the more people know, the more they want to help. “It’s with a heavy heart that I write today’s post. Despite all our efforts and despite the worldwide condemnation of the cruel dolphin slaughter, the Japanese government remains defiant and has allowed the first dolphin kill of this season at Taiji. “This defies all logic, both because of the brutal inhumane abuse of dolphins and because it is now proved that the dolphin meat is poison — containing dangerous levels of mercury. “Throughout the first month of the season several captures have taken place with select dolphins retained for export to zoos and aquariums. The rest of the pod were released back into the wild. However, a few days ago one group of 15 Risso’s dolphins was brutally killed and taken to the slaughterhouse. “I can’t tell you how angry this makes me. And I know it makes you angry, too. Many of you will be frustrated, but I don’t want you to lose hope. I also am more convinced than ever that our campaign to generate worldwide pressure for an end to the slaughter is right and must succeed. “We must be vigilant and turn up the heat. The Japan government’s defiance must not be allowed to stand. “Change does not happen overnight, and we have only just started to get the word out to the Japanese people. 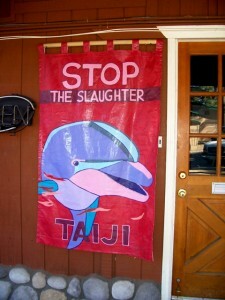 For more information, visit www.savejapandolphins.org, and www.takepart.com. 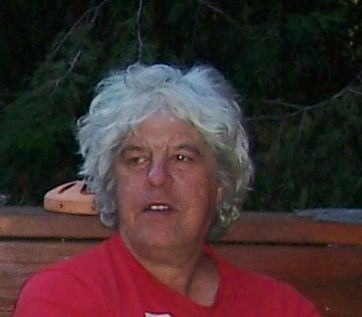 And if you want to receive Jeffrey Taylor’s dolphin updates, e-mail him at webmaster@greencafe.com.